A classic domed tungsten wedding ring . This wedding is the best to represent your love as it will stay permanently polished. This ring is made in comfort fit design. Click here for a brush finished version of this ring. Received ring ahead of the expected time so very happy. Gave it to my husband and he loved it. Will definitely shop with you guys again. This is a great ring. I already had one that was a smaller size for 8 and a half years. The one I ordered is the same great quality. It suited perfectly. 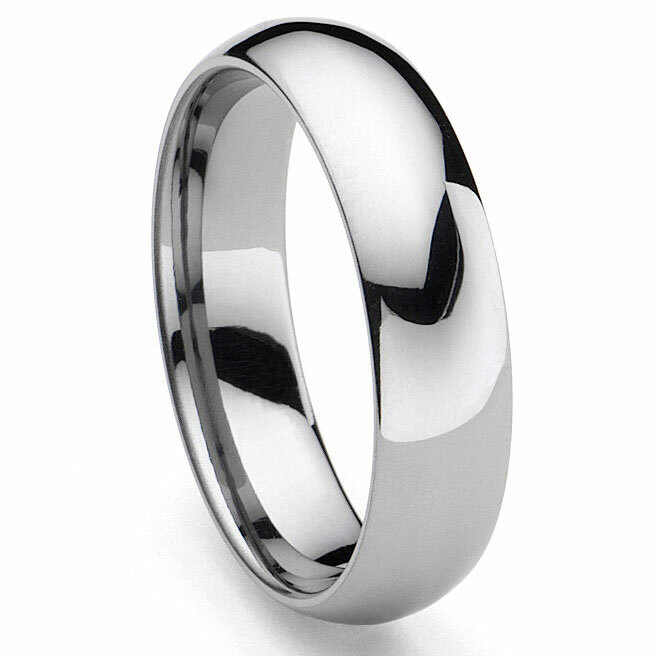 The engraving process was surprising because they want to be sure of your choice by sending the ring first for trial and confirmation of the name to engrave, but the process was very fast anyways. I loved shopping here. My wife gave me this ring for our 20 year anniversary. It is true. To size and very comfortable to wear! Looks very nice and shinny! I love the ring, especially the grayish/bluish hue depending on the light. I bought this a month ago and, although it hasn't exactly been put through the "wringer", it still has the same exceptional shine and not one single scratch can be seen even after purposely banging it on hard surfaces and dropping it on hard concrete from a few inches to listen to the high-pitched tinging from the exceptionally hard carbide metal alloy. This is the same stuff they use in saw teeth and snowplow blades (or so I'm told) and will last indefinitely in a wedding band, and at an exceptional price!